Bloom Racing Stable, Madaket Stable, and Allen Racing's Midnight Bisou had to work hard as the 4-5 favorite in the stretch of Sunday's Grade 1 Apple Blossom, fending off a determined drive from 8-1 chance Escape Clause. Under Hall of Fame rider Mike Smith, Midnight Bisou hit the wire a nose ahead of her rival to earn her third straight victory. The 4-year-old Midnight Lute filly, trained by Steve Asmussen, covered 1 1/16 miles over Oaklawn's “good” main track in 1:43.88. Bred in Kentucky by Woodford Thoroughbreds, Midnight Bisou was an $80,000 juvenile purchase at the OBS April sale. She now has three Grade 1 wins on her resume, including the Santa Anita Oaks and the Cotillion, and is the first horse to sweep the Azeri and the Apple Blossom since Close Hatches in 2014. Overall, Midnight Bisou's record stands at 8-3-3 from 14 starts and earnings of over $2.4 million. 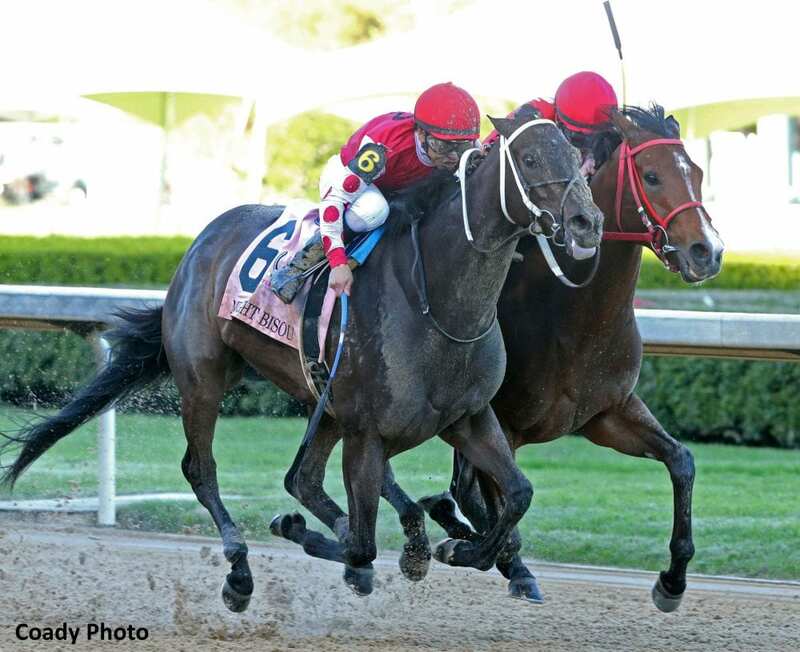 This entry was posted in NL Article, Racing and tagged Apple Blossom, Azeri Stakes, close hatches, escape clause, Horse Racing, midnight bisou, midnight lute, mike smith, Oaklawn, oaklawn park, omaha beach, steve asmussen, thoroughbred, Woodford Thoroughbreds by Paulick Report Staff. Bookmark the permalink.